Has anyone ever been locked out of their house? If you haven't, lucky you; just imagine what it would be like to lock your door and then the key to your place disappears, leaving you with the wrong stuff. What is this like? Me and my wife Bonnie have recently gone through this and it's scary when you have a home, but no home. This means you must find the key or get someone to pick that lock. It's expensive and embarrassing. 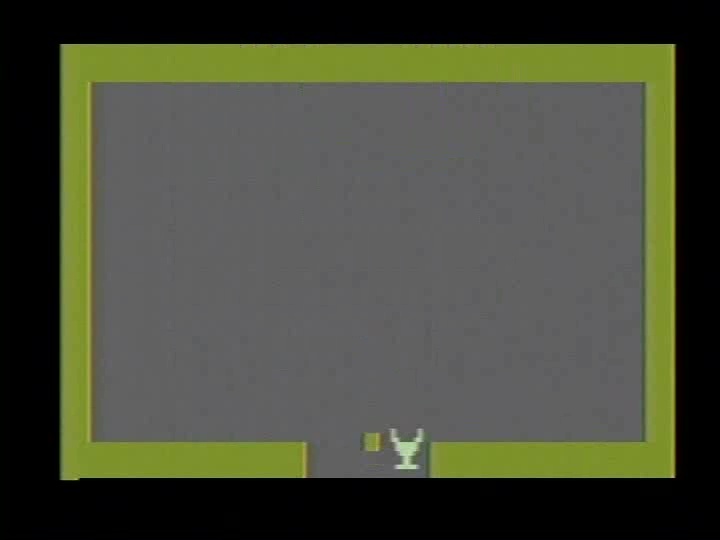 Our game clips come from an Atari2600 game known as Adventure. The object of this game is to defeat an evil magician's idea of a joke and find the correct keys to the corresponding castles, find a prized chalice and come home in victory. If I had to guess, the chalice is the holder of this good kingdom's power and authority. There are bad guys around though and they will try to eat you or frustrate you. For this section we are starting somewhat in the middle of one of these games, but pay attention to what is happening here. In this clip, we see the square (which is the hero), using a bridge to get a black key and notice that he gets lost a little bit with dead ends. This is only to showcase the bridge which is very important in this game if a wall divides you from your goal. What can the bridge mean? Jesus is the best example of our bridge. The black key would help storm the usually evil black castle. Usually it is guarded by a bad guy named Rhindle (The Red Dragon), another one, or a combination of the three. There are two others Grundle (The Green Dragon) and Yorgle (The Yellow Dragon). There is a black bat that is another symbol that we will study in future lessons in “Wrong Keys”) We are not storming yet as we need to show what happens when you have the wrong things. In this game, I had already taken out the Green and Yellow Dragons and set up an example which will be shown after this quick look at a scripture concerning the symbol of the bridge. Mat 16:13 When Jesus had come to the region of Caesarea Philippi, he asked his disciples, "Who do people say the Son of Man is?" Mat 16:14 They said, "Some say John the Baptist, others Elijah, and still others Jeremiah or one of the prophets." Mat 16:15 He asked them, "But who do you say I am?" Mat 16:16 Simon Peter answered, "You are the Messiah, the Son of the living God!" Mat 16:17 Then Jesus told him, "How blessed you are, Simon son of Jonah, since flesh and blood has not revealed this to you, though my Father in heaven has. Mat 16:19 I will give you the keys to the kingdom from heaven. Whatever you prohibit on earth will have been prohibited in heaven, and whatever you permit on earth will have been permitted in heaven." Mat 16:20 Then he strictly ordered the disciples not to tell anyone that he was the Messiah. Rev 1:9 I am John, your brother and partner in the oppression, kingdom, and patience that comes because of Jesus. I was on the island called Patmos because of the word of God and the testimony about Jesus. Rev 1:11 saying, "Write on a scroll what you see, and send it to the seven churches: Ephesus, Smyrna, Pergamum, Thyatira, Sardis, Philadelphia, and Laodicea." Rev 1:12 Then I turned to see who was talking to me, and when I turned I saw seven gold lamp stands. Rev 1:13 Among the lamp stands there was someone like the Son of Man. He was wearing a long robe with a gold sash around his chest. Rev 1:15 his feet were like glowing bronze refined in a furnace, and his voice was like the sound of raging waters. Rev 1:16 In his right hand he held seven stars, and out of his mouth came a sharp, two-edged sword. His face was like the sun when it shines with full force. Rev 1:18 the living one. I was dead, but look—I am alive forever and ever! I have the keys of Death and Hades. Rev 1:19 Therefore, write down what you have seen, what is, and what is going to happen after this. Rev 1:20 The secret meaning of the seven stars that you saw in my right hand and the seven gold lamp stands is this: the seven stars are the messengers of the seven churches, and the seven lamp stands are the seven churches." Since Jesus has the keys to everything, this will make things quite simple. Jesus said that he would give Peter the keys to heaven. This will be represented by the Gold key that we will see. Jesus also said that He has the keys to Death and Hades; these will be represented by the black key that we just saw. The white key is representing holiness and righteousness, along with everything that goes with them including faith etc. But, what happens if we don't carry the right keys to the right castles? The answer is simple in that absolutely nothing but frustration happens, as there is no success. Let's look at the keys in their incorrect places. As you can see, no one gets into any castle gates with wrong keys; you can't even go into the bad guys' castle without one. One thing that is interesting here is that when you have a home of any tiype, you will have a corresponding key. So, if Jesus has all keys to eveything, He determines what duplicates are given out, even to Death, Hell, and the grave. We don't want the bad keys unless we help to bring people or looted prizes out to go back where they truly belong, so these bad keys have a purpose, but these aren't home. Therefore, we are given the right and privilege to storm the enemy's gates when the time is right. So in short, the white and gold keys won't open the Black Castle, the white and black keys won't open the Gold Castle and the gold and black keys won't open the White castle. Jas 3:1 Not many of you should become teachers, my brothers, because you know that we who teach will be judged more severely than others. Jas 3:2 For all of us make many mistakes. If someone does not make any mistakes when he speaks, he is perfect and able to control his whole body. Jas 3:3 Now if we put bits into horses' mouths to make them obey us, we can guide their whole bodies as well. Jas 3:4 And look at ships! They are so big that it takes strong winds to drive them, yet they are steered by a tiny rudder wherever the helmsman directs. Jas 3:5 In the same way, the tongue is a small part of the body, yet it can boast of great achievements. A huge forest can be set on fire by a little flame. Jas 3:6 The tongue is a fire, a world of evil. Placed among the parts of our bodies, the tongue contaminates the whole body and sets on fire the course of life, and is itself set on fire by hell. Jas 3:8 but no one can tame the tongue. It is an uncontrollable evil filled with deadly poison. Jas 3:9 With it we bless the Lord and Father, and with it we curse those who are made in God's likeness. Jas 3:10 From the same mouth come blessing and cursing. It should not be like this, my brothers! Jas 3:11 A spring cannot pour both fresh and brackish water from the same opening, can it? Jas 3:12 My brothers, a fig tree cannot produce olives, nor a grapevine figs, can it? Neither can a salt spring produce fresh water. Jas 3:13 Who among you is wise and understanding? Let him show by his noble conduct that his actions are done humbly and wisely. Jas 3:14 But if you have bitter jealousy and rivalry in your hearts, stop boasting and slandering the truth. Jas 3:15 That kind of wisdom does not come from above. No, it is worldly, self-centered, and demonic. Jas 3:16 For wherever jealousy and rivalry exist, there is disorder and every kind of evil. Jas 3:17 However, the wisdom that comes from above is first of all pure, then peace-loving, gentle, willing to yield, full of compassion and good deeds, and without a trace of partiality or hypocrisy. Jas 3:18 And a harvest of righteousness is grown from the seed of peace planted by peacemakers. Jas 4:1 Where do those fights and quarrels among you come from? They come from your selfish desires that are at war in your bodies, don't they? Jas 4:2 You want something but do not get it, so you commit murder. You covet something but cannot obtain it, so you quarrel and fight. You do not get things because you do not ask for them! Jas 4:3 You ask for something but do not get it because you ask for it for the wrong reason—for your own pleasure. Jas 4:4 You adulterers! Don't you know that friendship with the world means hostility with God? So whoever wants to be a friend of this world is an enemy of God. Jas 4:5 Or do you think the Scripture means nothing when it says that the Spirit that God caused to live in us jealously yearns for us? Jas 4:6 But he gives all the more grace. And so he says, "God opposes the arrogant but gives grace to the humble." Jas 4:7 Therefore, submit yourselves to God. Resist the devil, and he will run away from you. Jas 4:9 Be miserable, mourn, and cry. Let your laughter be turned into mourning, and your joy into gloom. Jas 4:10 Humble yourselves in the Lord's presence, and he will exalt you. Jas 4:11 Do not criticize each other, brothers. Whoever makes it his habit to criticize his brother or to judge his brother is judging the Law and condemning the Law. But if you condemn the Law, you are not a practicer of the Law but its judge. Jas 4:12 There is only one Lawgiver and Judge— the one who can save and destroy. So who are you to judge your neighbor? We are talking about being two-faced, quarrelsome and spreading that divisiveness. This is a definite wrong key. Instead, this is what Jesus says in Matthew 7: 12-20. Mat 7:12 Therefore, whatever you want people to do for you, do the same for them, because this summarizes the Law and the Prophets." Mat 7:13 "Go in through the narrow gate, because the gate is wide and the road is spacious that leads to destruction, and many people are entering by it. Mat 7:14 How narrow is the gate and how constricted is the road that leads to life, and there aren't many people who find it!" Mat 7:15 "Beware of false prophets who come to you in sheep's clothing but inwardly are savage wolves. Mat 7:16 You will know them by their fruit. Grapes aren't gathered from thorns, or figs from thistles, are they? Mat 7:17 In the same way, every good tree produces good fruit, but a rotten tree produces bad fruit. Mat 7:18 A good tree cannot produce bad fruit, and a rotten tree cannot produce good fruit. Mat 7:19 Every tree that doesn't produce good fruit will be cut down and thrown into a fire. Mat 7:20 So by their fruit you will know them." Being two-faced is a kind of lie that a lot of times has embedded arrogance in it. There is no place for this in the Christian faith walk, but all of us are prone to it and are guilty. Righteousness and Holiness (White)and our key to home (Gold) cannot open the usually evil Black Castle. Even when a strong faith walk exists, the enemy stronghold is right there waiting locked tight, so the evil magician's thefts won't be righted. When the chalice is home, the Black Castle would become again under rightful authority of whoever the king is for the kingdom. 1Co 9:24 You know that in a race all the runners run but only one wins the prize, don't you? You must run in such a way that you may be victorious. 1Co 9:25 Everyone who enters an athletic contest practices self-control in everything. They do it to win a wreath that withers away, but we run to win a prize that never fades. 1Co 9:26 That is the way I run, with a clear goal in mind. That is the way I fight, not like someone shadow boxing. 1Co 9:27 No, I keep on disciplining my body, making it serve me so that after I have preached to others, I myself will not somehow be disqualified. 2Ti 2:1 As for you, my child, be strong by the grace that is in the Messiah Jesus. 2Ti 2:2 What you have heard from me through many witnesses entrust to faithful people who will be able to teach others as well. 2Ti 2:3 Join me in suffering like a good soldier of the Messiah Jesus. 2Ti 2:4 No one serving in the military gets mixed up in civilian matters, for his aim is to please his commanding officer. 2Ti 2:5 Moreover, no one who is an athlete wins a prize unless he competes according to the rules. 2Ti 2:6 Furthermore, it is the hard working farmer who should have the first share of the crops. 2Ti 2:7 Think about what I am saying. The Lord will help you to understand all these things. 2Ti 2:8 Meditate on Jesus, the Messiah, who was raised from the dead and is a descendant of David. This is the gospel I tell others. 2Ti 2:9 Because of it I am experiencing trouble, even to the point of being chained like a criminal. However, God's word is not chained. 2Ti 2:10 For that reason, I endure everything for the sake of those who have been chosen so that they, too, may receive the salvation that is in the Messiah Jesus, along with eternal glory. 2Ti 2:11 This saying is trustworthy: In dying with the Messiah, true life we gain. 2Ti 2:12 Enduring, we with him will reign. Who him denies, he will disclaim. 2Ti 2:13 Our faith may fail, his never wanes— That's who he is, he cannot change! 2Ti 2:14 Remind others about these things, and warn them before God not to argue over words. Arguing does not do any good but only destroys those who are listening. 2Ti 2:15 Do your best to present yourself to God as an approved worker who has nothing to be ashamed of, handling the word of truth with precision. 2Ti 2:17 and what they say will spread everywhere like gangrene. Hymenaeus and Philetus are like that. 2Ti 2:18 They have abandoned the truth by claiming that the resurrection has already taken place, and so they destroy the faith of others. 2Ti 2:19 However, God's solid foundation still stands. It has this inscription on it: "The Lord knows those who belong to him," and "Everyone who calls on the name of the Lord must turn away from evil." 2Ti 2:20 In a large house there are not only utensils made of gold and silver, but also those made of wood and clay. Some are for special use, while others are for ordinary use. 2Ti 2:21 Therefore, if anyone stops associating with these people, he will become a special utensil, set apart for the owner's use, prepared for every good action. 2Ti 2:22 Flee from youthful passions. Instead, pursue righteousness, faithfulness, love, and peace together with those who call on the Lord with a pure heart. 2Ti 2:23 Do not have anything to do with foolish and stupid discussions, because you know they breed arguments. 2Ti 2:26 so that they might escape from the devil's snare, even though they've been held captive by him to do his will. The Devil is kind of like the evil magician in the game who steals all the sacred objects, puts them in the wrong places, and sets up booby traps along with bad trades. Here is the sacred chalice at home where it belongs (inside the Gold Castle). We have to remember who we work for, who we work against and keep our heads straight in Christ, so that we will run the spiritual race well and win the prize that never fades.